Buy Mack Brush Series 258 Script brushes here. Synthetic White Taklon Rigger Black Polished Handles Seamless Nickel Ferrules. Outlining and script can be done easily with this rigger. Synthetic White Taklon has the same snap and lettering qualities as sable, but at a considerably lower price. also known as , lettering script liner brushes, script brushes, outliner script brush, detail script brush, mack brush script liner and pinstripe script liners. Listed below. Script Outliner Brush Taklon Size 1 Series 258 Buy Script Outliner Brush Taklon Size 1 Series 258. Mack Brush Series 258 Size 1, Length Out -.. Script Outliner Brush Taklon Size 10 Series 258Script Outliner Brush Taklon Size 10 Series 258. Mack Brush Series 258 Size 10, Length Out – 3/16",.. Script Outliner Brush Taklon Size 2 Series 258Script Outliner Brush Taklon Size 2 Series 258. Mack Brush Series 258 Size 2, Length Out – 5/16", Sy.. 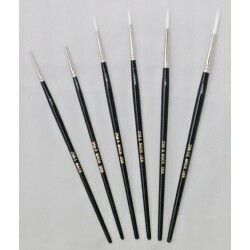 Script Outliner Brush Taklon Size 4 Series 258Script Outliner Brush Taklon Size 4 Series 258. Mack Brush Series 258 Size 4, Length Out – 7/16", Sy.. Script Outliner Brush Taklon Size 6 Series 258Script Outliner Brush Taklon Size 6 Series 258. Mack Brush Series 258 Size 6, Length Out –9/16", Syn.. Script Outliner Brush Taklon Size 8 Series 258Script Outliner Brush Taklon Size 8 Series 258. Mack Brush Series 258 Size8, Length Out –11/16", Syn..